One person brings themselves to the table and they are braiding with the frequencies, or colors of the other person.This represents the co-creative potential for both together, which is beyond what the possibilities of one individual. 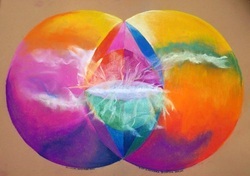 The new creationwhich is their interaction and experience is the blending or braiding of these colors. One person cannot dominate. It has to be a safe space for each to be themselves, their authentic self so their frequencial colors flow. If both come to the table as themselves, making safe space for the "other" or others, then there is infinite creativity possible in co-creation. The colors of one combine with the colors of the other, and a third color is formed. The essential ingredient to bring to co-creation is love. Love helps everyone show up in truth as themselves and their true colors shine and are creatively braided in the whole. A circle does this with all participants, and this is the way of unity consciousness. Indigenous people have been good at doing this, along with others. They make space for all within the circle, including the connection to the ancestors and the animal kingdom, the plant and the mineral kingdom. They hear the voices that are co-creaing with them even if they are not physically present. Willingness to listen and be present with the needs of the whole, the highest good of all in mind, is also needed in this new paradigm of relating and co-creation. Your aspects within have need to come into balance and harmony together, as if they were at a round table together. Evenyone gets heard and integrated. This could be your inner child, your parent, your sage, or your warrior. It could be aspects of you..that have different opinions about how to proceed.The important part is to find the harmony and wholeness and come to harmony within. Hearing your guides and feeling their frequency, their energetic support and advising assists you in finding inner harmony. Of course, this takes going within, such as a meditation practice where you commune with them. Think of it as communing and attuning to your higher self and who you really are. You move through life more as your true authentic self, not caring what others think, and with a feeling of ease that makes it easy to be loving and kind to others. The harmony you create within ripples out to the whole world. When you are going forward in harmony with yourself, bringing in aspects that resonates in the world and attracts that quality of harmony. Your groups, relationships, interactions and co-creations will be effected greatly and experience harmony. One can go within and create harmony with another, or others; outside of being in the group physically. When you come together, there will be this spectacular harmonic blending of colors, infinite creation with joy, and resonance. See it, feel it, when you are with others, that harmony you feel in yourself when you meditate or are in joyfully alone. A subtle attunement can happen so there is listening (within and to others) and also being present, fully present to the other and to the now. There is a commitment to allowing each to be the participation. This is the basis of change among humans, within romantic relationships, within parenting, within workplaces. The hierarchical part of evolution is ending and a new unity is coming about in that people are relating as equals. So much is possible. The greater good is being enhanced. So much potential and possibility is here. The new crystal, indigo and rainbow children are the embodiment of this energy. They know how to do it so let us listen and learn. Let us entrain to their knowing. It takes throwing what we know about parenting and how children aresupposed to act out the window. We have to recognize them as old souls and equals. We have to recognize each other as equals and learn to blend our energies without control battles as happens in relationships, often relating to worn out male and female patterns which we which we have been conditioned. Let's let go of those patterns with a blank slate to co-create in a new way that will look different and feel amazing once we get the hang of it. The idea of coming together is a blending of harmonic frequencies in resonance instead of dissonance. How can we bring more harmony and resonance to all that we do?